Click on picture to see TK describe being jackhammered out of a home. 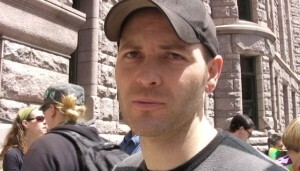 His head covered by a shroud, an Occupy Minnesota activist could only hear the sounds of jackhammers and saws as Sheriff’s deputies attempted to extract him from his self-imposed imprisonment. TK was one of many people trying to prevent the eviction of the Cruz family from their South Minneapolis home on Tuesday. He had chained his arms inside two 55-gallon drums filled with concrete to make it difficult to remove him from the home. TK suffered burns and cuts on his hands as deputies hacked and hammered away at the concrete, but he said the injuries were minor compared to the injury the community was suffering from the eviction. Freddie Mac got a court order to evict the Cruz family. Despite evidence that the family was working with PNC Bank which services the mortgage, the Hennepin County Sheriff’s office tried to raid the house twice in the last week. 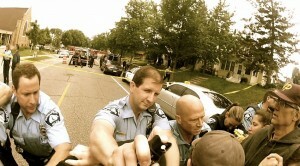 A third raid by mostly Minneapolis police and a few sheriff’s deputies on Tuesday finally evicted the Occupy Minnesota protesters who were trying to defend the home for the Cruz family. In the video, TK described the ordeal. He was arrested for trespass and held under $80,000 bail, which was later reduced to $50. He was not seriously injured. He also confirmed the use of pepper spray by one of the Minneapolis Police officers. Human Rights Day in Minnesota prompts a discussion of race relations both in the U.S. and abroad.